Set in the former harbour area, surrounded by renovated warehouses and new skyscrapers, the Vertical City by O.M.A. has become a new landmark in Rotterdam. The trade company Nidera occupies the entire 5th floor in the lower building. 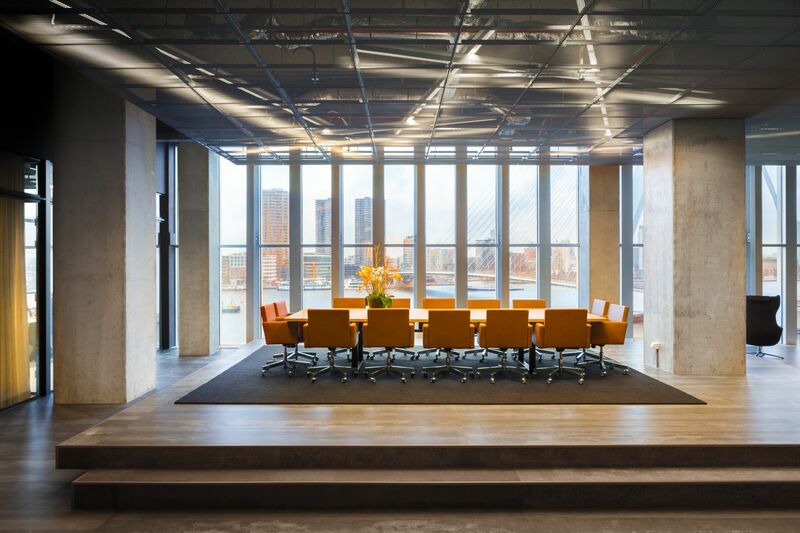 With the aim to stimulate informal meetings and collaboration, the designers at Fokkema & Partners were challenged to interconnect the offices despite the massive concrete cores with their elevators and shafts passing through to the upper building. Clever programming, lighting solutions and material use have made the interior areas into exciting spaces that are intensively used. 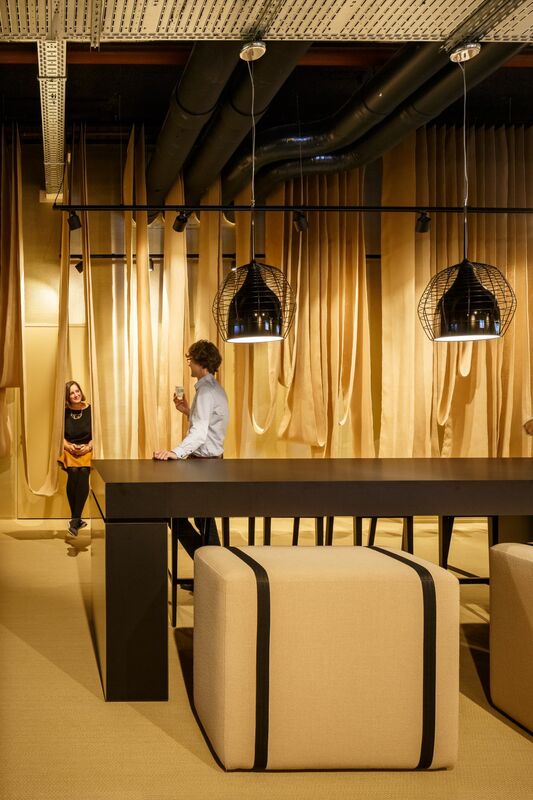 The interior celebrates the scale and character of the building, but, above all, it identifies with the characteristics of the company, where ‘bold’ and ‘corporate’ meet. 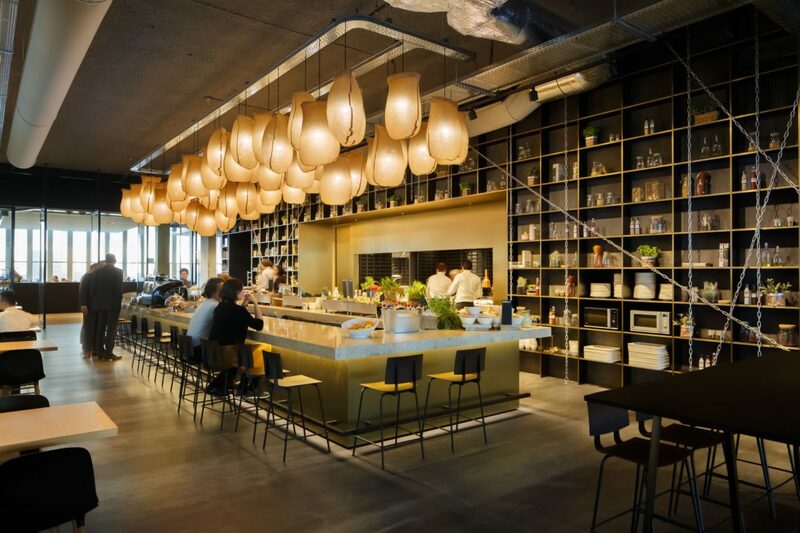 The public atrium contains the restaurant with its elongated bar in the centre where staff of different departments can work, meet and welcome guests. A special lighting solution has been introduced to express both the stamina of the agricultural business and the warmth of the restaurant. A cloud of 61 jute ‘bag lamps’ identifies with the characteristics of the old harbour dock location and lights up the heart of the office. FOK-lab developed the ‘bag lamps’ or ‘zaklamp’ for Nidera.